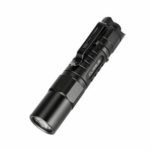 Prince is an unique and decent EDC flashlight that Lumintop unveiled recently, it was born to be loved by you and by many flashlight fans and collectors. With the body shell employing premium carbon fibre which enjoys the reputation of “the queen of new materials”, Prince has high strength-to-weight ratio, high corrosion resistance and high temperature tolerance. It pretends to be tender outside while being pretty tough and strong inside. Black square texture with inlaid golden fibre can be easily associated with a magnificent, cool armour that the Prince wears. 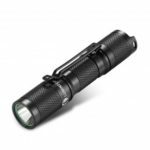 Utilizes the latest Cree XP-L LED with 50,000-hour lifetime. 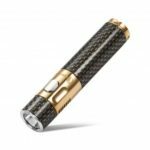 Light body is made from premium carbon fibre that is lightweight yet rugged, resistant to corrosion, wear and high temperature. The head and tail part are made from copper. Special cutting technology is employed to shape an array of three-dimensioned small cubes on the tail part, forming a fantastic touch and an eye-catching look. 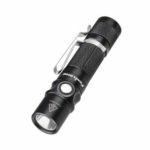 Optimized ultra-precise reflector offers a long beam distance. Double-side AR coated, tempered window resists impact and thermal shock, maximizes light transmission (99% light transmittance). 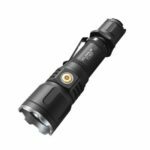 Multi-function, bit tail clicky switch provides one-handed operation and easy access to all functions. The metallic tail switch featuring anti-abrasion allows stand up securely on a flat surface to serve as a candle. Equipped with leather holster, Prince can be fixed on the belt and easy to carry around. 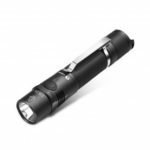 Market applications include, but are not limited to everyday carry, collection, gift, outdoor activities, emergency, security, hardware/tool and many other uses.